On this day in 1968, still three years away from the Fight of the Century (against Muhammad Ali in 1971), Joe Frazier defended his New York State Athletic Commission heavyweight title before his hometown fans at the Spectrum. 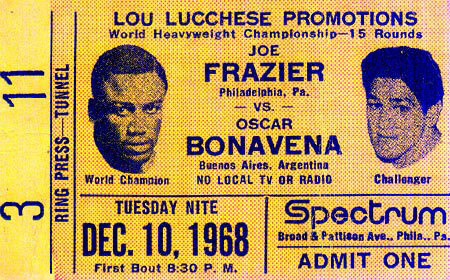 His opponent, the tough Argentine Oscar Bonavena, was an old nemesis who gave Frazier his hardest test to date two years earlier. This time it was a bit easier for Frazier, who built an early lead, fended off Oscar's late rush, and won the unanimous 15-round decision to run his record to 22-0.